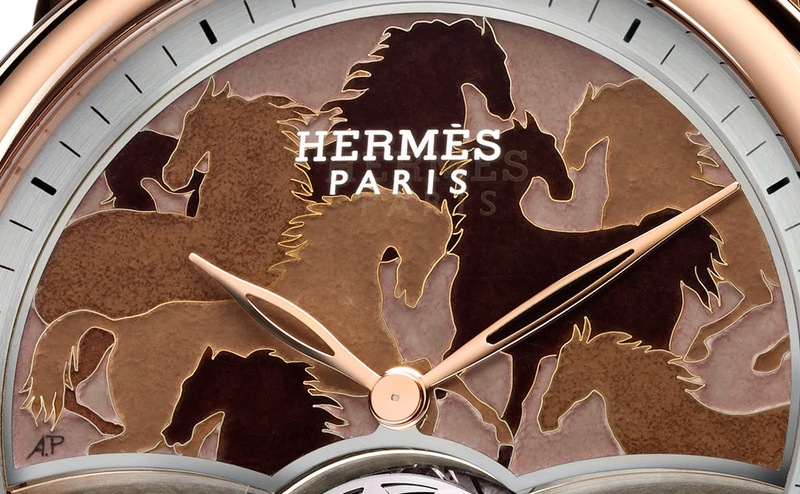 Available in two 24-piece limited editions, the Arceau Lift Chevaux en Camouflage by Hermès combines the mechanical mastery of a flying tourbillon with the artistic beauty of a cloisonné enamel reproducing a motif inspired by a Hermès silk carré. 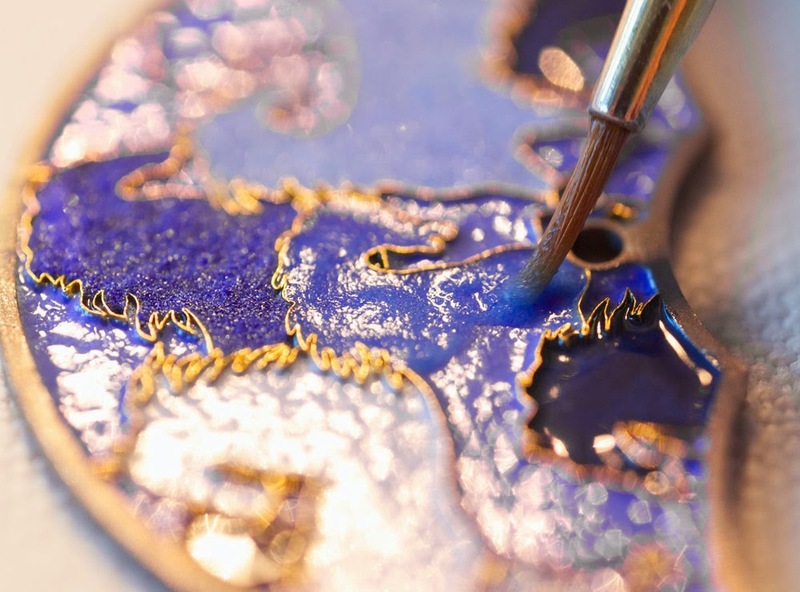 Cloisonné enamelling is a precious but painstaking hand-crafted process. 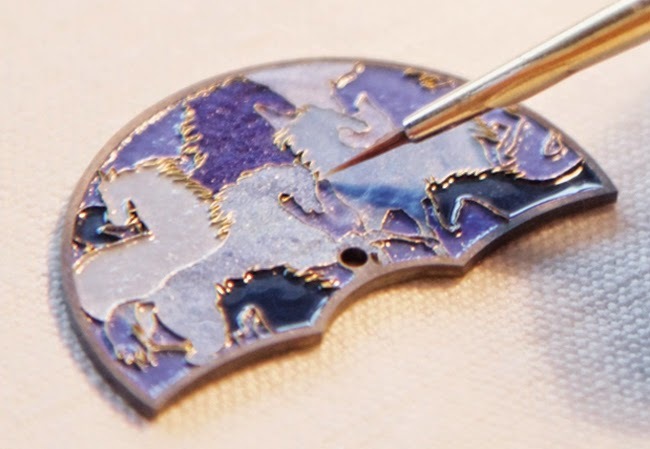 After sketching on paper the outlines of the horses, the enameler creates tiny gold wires which will separate the different compartments (cloison) of the enamel or inlays. Using tiny brushes, the enameler places the fine colored powder into each cloison leaving it to dry before firing at around 800°. The enamel in the cloisons will sink down after firing, due to melting and shrinkage of the granular nature of the glass powder. This process is repeated until all cloisons are filled to the top of the wire edge so creating lot of subtle nuances. The cage of the flying tourbillon is topped with a double H symbol inspired to the symbol of the lift of the historical Hermes boutique at Faubourg Saint Honoré in Paris. The artistic and mechanical beauties of this timepiece are framed by a red or white gold case with a diameter of 43 mm. 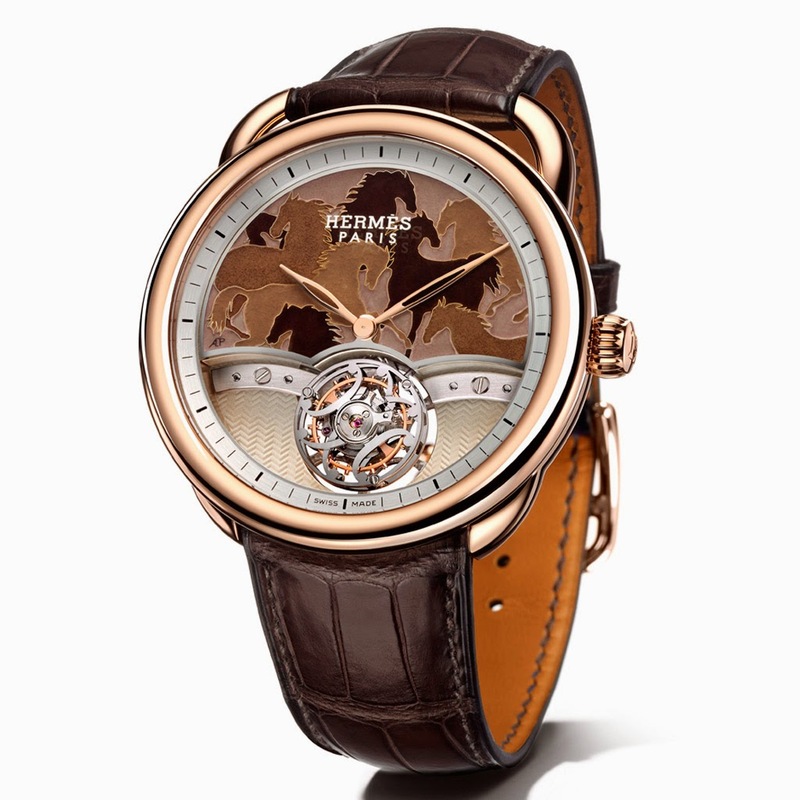 The caseback is engraved with the Hermès ex libris and features a chased opening over the flying tourbillon. The hand wound manufacture movement beats at 21,600 vibrations per hour and offers a remarkable power reserve of 90 hours. Bridges are meticulously chamfered and polished by hand. In keeping with the origins of Hermès, the Arceau Lift Chevaux en Camouflage is fitted with a havana or blue alligator strap with finely crafted saddle stitching. 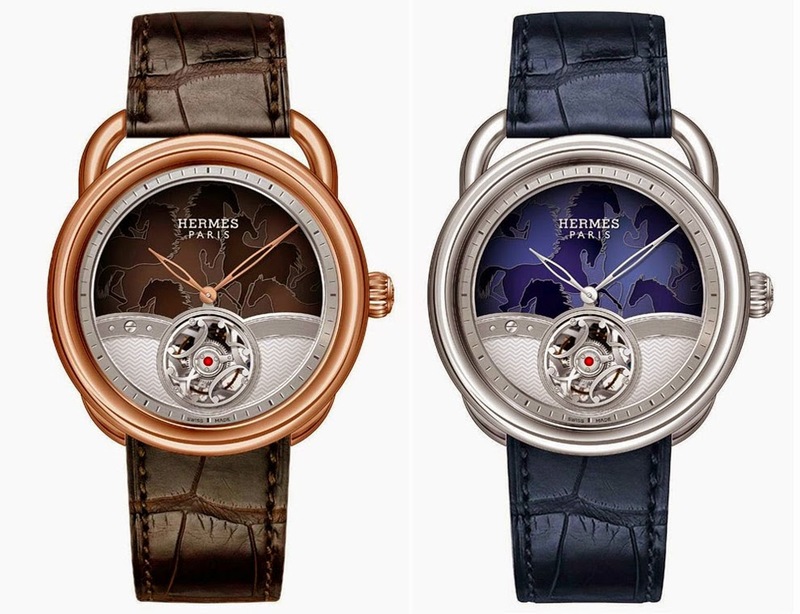 Available in two 24-piece limited editions, the Arceau Lift Chevaux en Camouflage by Hermes combines the mechanical mastery of a flying tourbillon, whose cage is topped with a double H symbol, with the artistic beauty of a cloisonné enamel reproducing a motif inspired by a Hermès silk carré. 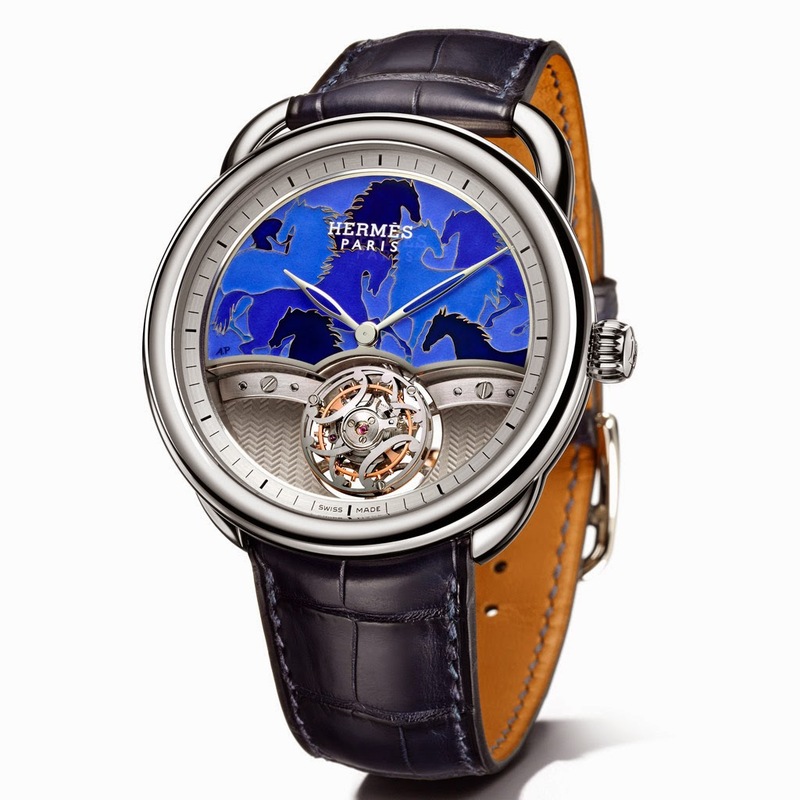 The artistic and mechanical beauties of this timepiece are framed by a red or white gold case with a diameter of 43 mm.